Published author Conn Hamlett returns to the literary limelight with the release of the fifth book of the “John Lee Johnson” series. 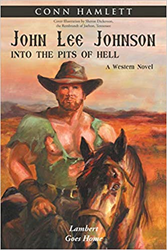 In “John Lee Johnson: Into the Pits of Hell” (published by Abbott Press), the threatening clash between right and wrong, good and bad continues. Set in the 1865 postwar Texas where radical carpetbaggers and scalawags are running the government, this Western thriller narrates the adventures of former confederate soldier, John Lee Johnson. John finds himself haunted by a past foe. Frank McGrew, an ex-union general, holds John in disdain and now hatches a plan that forces John to face the notorious pit fighter El Toro in Chihuahua, Mexico. John survived the Civil War; now, he must survive El Toro, McGrew and those who plot to steal the peace he has worked so hard to find. To order a copy and follow a saga that chronicles the battle between a powerful hero and a powerful foe, visit https://www.amazon.com/John-Johnson-into-Pits-Hell/dp/1458221962. Conn Hamlett earned a bachelor of arts from Lipscomb University and a master of arts from Peabody/Vanderbilt. His diverse career has included roles as a Latin teacher, professional wrestler in the NWA, competitive bodybuilder, radio personality and radio sports host. When Hamlett is not traveling the world, he lives in Joelton. Abbott Press, a division of Writer’s Digest – the oldest and most respected publisher devoted to the education and advancement of writers – is an indie-publishing imprint dedicated to helping writers bring their literary vision to print. Author Solutions, LLC, a leader in indie book publishing, will fulfill publishing, sales, and marketing services for Abbott Press. For more information, or to begin publishing a book today, log on to abbottpress.com or call 866-697-5310. Previous articleKat Copeland’s Newly Released “A Poetic Journey” Is a Heartening, Realistic Portrait of Happiness and Love Rendered in Poetic Verse.